Financial Planning, Wealth Management and Prospect Theory, Oh My! Have you ever introspectively examined how you feel about risk? Not only in your day to day living, but in terms of perceived risks to your financial planning, retirement planning, wealth management, and investment portfolio management? Regardless of whether you live in Simi Valley, Moorpark, or Thousand Oaks; understanding how you emotionally respond to those risks can provide helpful insights on how you should pursue your long-term financial goals. We will examine how prospect theory effects financial investments and contributes to some investors making poor long-term financial decisions. So, what is prospect theory and what does it mean to you? Prospect theory attempts to model how people make choices about risky outcomes. 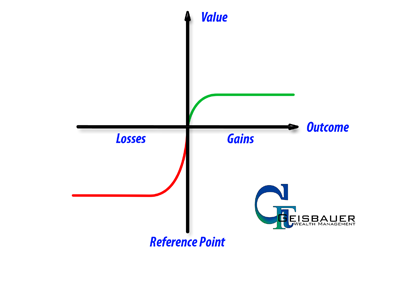 People tend to make decisions based on what they estimate the value of their gains or losses to be as opposed to the final outcomes. Research suggests that people dislike losses about twice as much as they like equivalent gains. This is an example of loss aversion as studied by Daniel Kahnerman and Amos Tversky. The graph below provides an illustration of this. Loss aversion illustrates the challenges we face with our emotions when perceiving potential gains and losses in asset management, wealth management, and financial planning. Anecdotally speaking, I have met with investors who I would say dislike losses four times as much as they like equivalent gains. This was especially true during 2008′s great recession where it seemed investors were constantly looking at their financial investments daily. This constant reminder is what economists call myopic loss aversion. Myopic loss aversion is the more we are reminded of our losses the more we compound the effect of loss aversion. For example, investors who check their account balances more often are in turn more often reminded of losses which causes even more “dislike”. Unfortunately, when markets behave erratically, this can push investors over the edge leading them to make poor long-term financial decisions by selling at the lows and either buying back at higher prices or paralyzing them from ever reinvesting altogether. Below is a chart from Fidelity Investments, showing that the S&P 500 has experienced 179 days of a greater than 2% decline during the past 13 years as compared to 174 days of a greater than 2% decline over a 53-year period (from 1948 to 2000). I am sure your eyes zeroed in, as did mine, on the missing data from 1928 to 1948. I wish the chart would have tallied the days of a greater than a 2% decline from some time period in there. To me, this chart shows that markets historically can go through ugly decades or more of extreme volatility. Our recent 13 year period doesn’t seem as dramatic as the 1928 through 1948 period, at least visually speaking. So, how do we overcome a lot of the psychological scaring that has resulted from this extreme 13 year period of volatility? In my experience, having an emphasis on long-term financial planning, wealth management, and proper risk controlled asset management goes a long way to help alleviate the effects of extreme loss aversion. Implementing timely portfolio risk minimization strategies are critical to maintaining investor confidence and minimizing the effects of loss aversion. Unfortunately, still, a lot of investors will need time to validate that the markets are returning to a more subjective “normal” period of volatility. Until then, this will most likely continue to cause investors to underweight equities for longer than they should. If you have any questions or would like to learn more about how we manage investment portfolio risk in uncertain times, especially like in 2008, please contact me directly at (805) 558-8497 or at tim@geisbauerwealth.com. The Standard & Poor’s 500 Index is a capitalization weighted index of 500 stocks designed to measure performance of the broad domestic economy through changes in the aggregate market value of 500 stocks representing all major industries. The S&P 500 index is an unmanaged index which cannot be invested into directly. Past performance is no guarantee of future results. This article was posted in Blog and tagged financial planning, prospect theory, wealth management. Bookmark the permalink. Follow comments with the RSS feed for this post.Post a Comment or leave a trackback: Trackback URL.